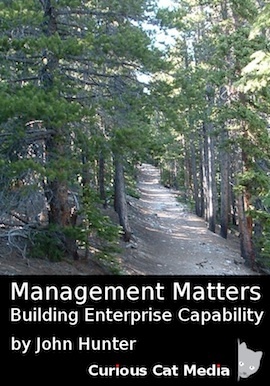 I continue to record podcasts as I promote my new book – Management Matters: Building Enterprise Capability. This the second part, of 2, of my podcast with Joe Dager, Business 901: Management Matters to a Curious Cat. The first part featured a discussion of 2 new deadly diseases facing companies. This entry was posted in Books, Deming, Management, Psychology, Systems thinking and tagged Books, build capability, Data, Deming, John Hunter, Joy in Work, management, podcast, Psychology, Six sigma, Software Development, Statistics, Systems thinking on February 19, 2013 by John Hunter. “the most important figures that one needs for management are unknown or unknowable” Lloyd Nelson as quoted by Dr. Deming in Out of the Crisis. This entry was posted in Books, Deming, Management and tagged Books, Deming, John Hunter, Management Matters, podcast on February 10, 2013 by John Hunter. 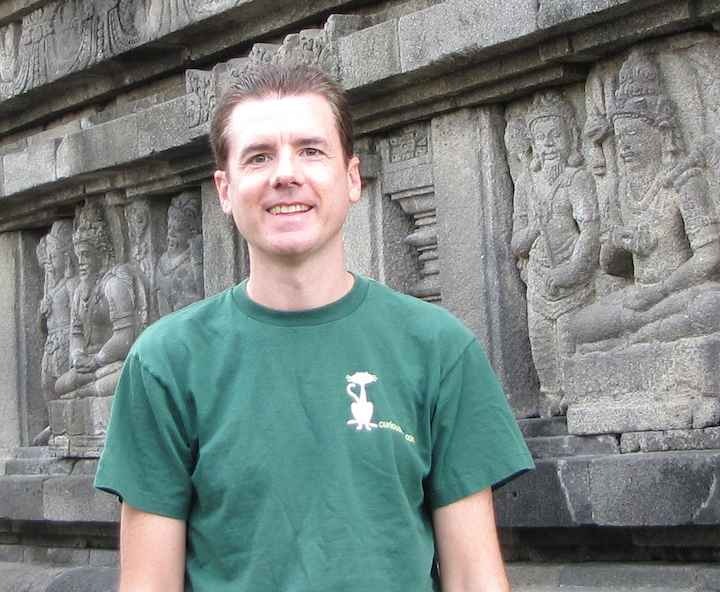 I recently was interviewed for a podcast by Len Epp with Leanpub: Leanpub Podcast Interview #9: John Hunter. I hope you enjoy the podcast (download the mp3 of the podcast). Posts on appropriate technology on my Curious Cat Engineering blog. The last 15 minutes of the podcast I talk about some details of working with Leanpub; I used Leanpub to publish Management Matters. I recommend Leanpub for other authors. They don’t just have lean in their name, they actual apply lean principles (focusing on the value chain, eliminating complexity, customer focus, etc.) to operating Leanpub. It is extremely easy to get started and publish your book. Leanpub also offers an excellent royalty plan: authors take home 90% of the revenue minus 50 cents per book. They publish without “digital rights management” crippling purchasers use of the books. Buyers have access to pdf, kindle (mobi) and epub (iPad, nook) format books and get access to all updates to the book. All purchases include a 45 day full money back guaranty. 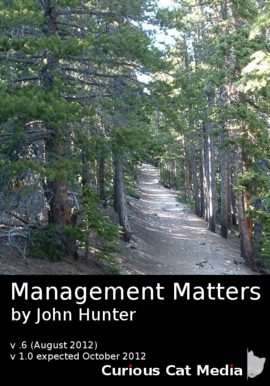 This entry was posted in Books, Data, Deming, Management, Systems thinking and tagged Books, Data, Deming, John Hunter, leadership, management, Management Matters, overpaid executives, podcast on January 23, 2013 by John Hunter. I am a big fan of Dr. Deming’s ideas on management. The way I see one of the quotes of Dr. Deming used I don’t agree with. Dr. Deming said “How could they know?” to explain why people continued to follow less successful practices (for example, page 55 of Out of the Crisis). How could they know of better practices, he would say. I must say I have always thought the answer to that question was pretty easy. They could learn about the job they were paid to do. It is a shame that many organizations do a very poor job of preparing or coaching those they promote into management for their new position. However, I don’t see that as an excuse to fail to learn yourself. There are plenty of books with great information. How could they know? They could read. Yes, there are also plenty of management books filled with nonsense. That does make it a bit more difficult. But I still don’t have much sympathy for hearing, “how could they know” as a reason for continuing performance appraisals or failing to understand variation or falling to know that “motivating” through monetary rewards backfires or… If you wish to manage human systems I don’t think it is too much to expect you to know about how to do so, and have the knowledge to distinguish nonsense from well reasoned thoughts. If you want to take on a management job you should take your responsibility seriously. Choosing not to take advantage of the wealth of great material in the past 70 years on how to manage more effectively is not a decent excuse. How could they know? They could take responsibility to learn. If they chose not to do so that is their choice. They chose not to know. I guess some can see that as an acceptable excuse. I don’t. If they are trying to apply ideas and having trouble: I have sympathy for that. Applying ideas on management is not easy. Human systems are complex and there are no simple guides that tell what is needed in your specific situation and organization. but ignorance of basic management principles, with no evidence of concerted efforts to learn I don’t have sympathy for. I seem to expect more from managers than most people I talk with. Most seem to find it a perfectly acceptable excuse that a manager never bothered to learn about management. I don’t really understand that. Dr. Deming did seem to hold senior executives accountable for failing their organizations, but he was more accepting of manager’s ignorance than I am. 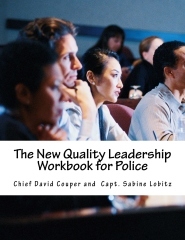 Read and use The Leader’s Handbook and The Improvement Guide and you will be well ahead of most of the management practice I see. 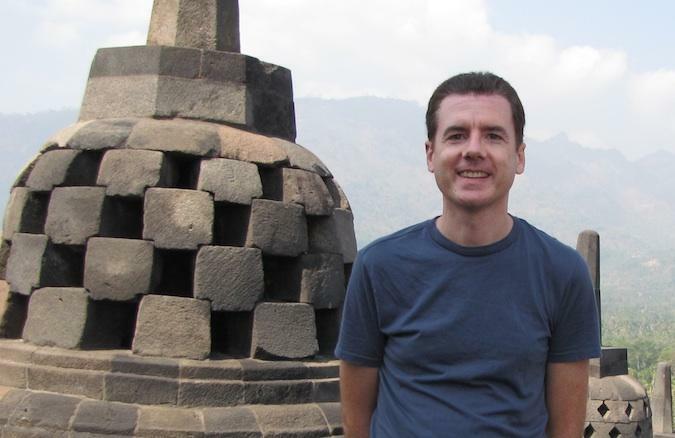 This entry was posted in Deming, Management and tagged Books, Career, commentary, Deming, leadership, learning, management on March 28, 2012 by John Hunter.